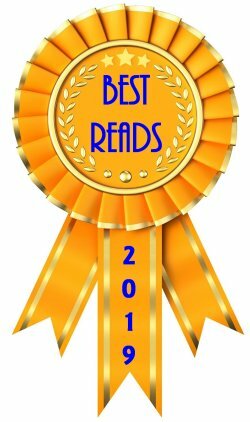 My Top Ten Visited Places in the U.S.
Top Ten lists must be like potato chips-- you can't compile just one. In my case, I think it's getting easy for me because I've begun to think of it as making today's list which acknowledges that tomorrow's list may be completely different. 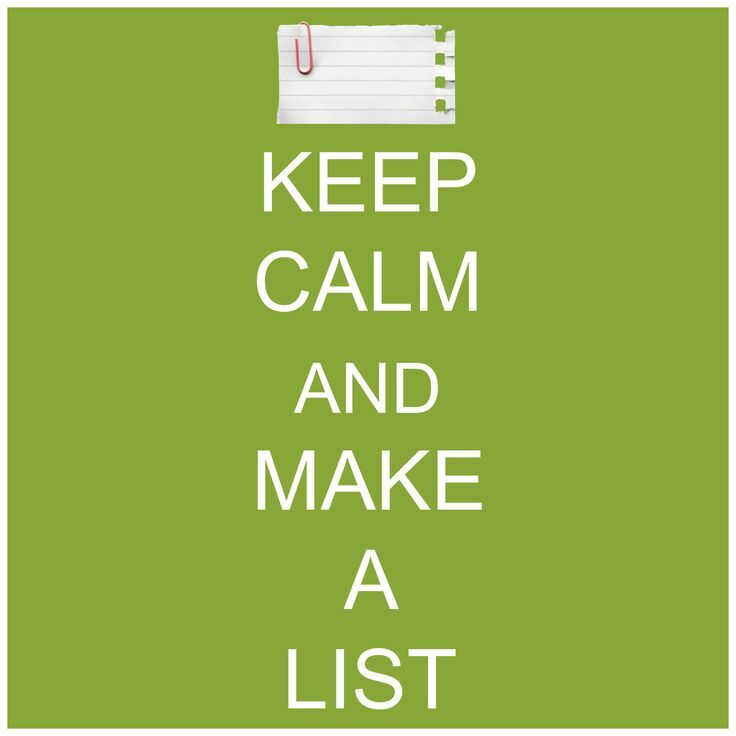 I know it would be for today's list. I've done quite a bit of traveling in the U.S., most of it by car. From Sunday drives all around the state of Illinois when I was growing up, to a cross-country trip to California when I was ten, to flying coast to coast for my job, and on to vacations with my husband, I've seen quite a bit and know that I have quite a bit more to see. Right now the spots I've missed are New England, Alaska, and Hawaii. 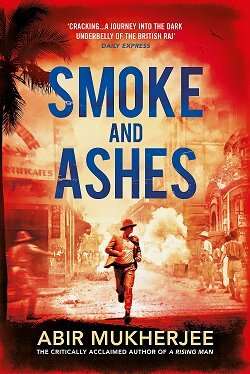 With my reluctance to participate in the endurance trials that now comprise air travel, I'm wondering if I could board a ship to get to Hawaii? But I'm veering off topic. Here's my list of the most memorable places I've visited here in the United States. Click on the place name in the caption beneath each photo to be taken to more information about that place. You can also click on any photo to have it automatically open in a new window so you can see it full size. I also have a feeling that I'll be sharing a memory or two along the way, so I'd better get started! Thomas Jefferson's Monticello in Virginia. I have visited two homes of famous Americans in which I felt the presence of greatness. Monticello is one of them, but my feeling about this place is stronger than some sort of hero worship. 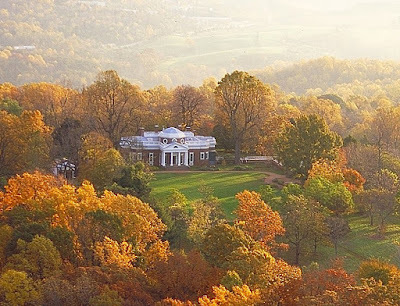 I truly love the house and its placement on a little mountain outside of Charlottesville, Virginia. When the tour guide led us through Jefferson's suite of rooms on the first floor-- library, study, bedroom, dressing room (in that order)-- with the sunlight streaming through those marvelous windows, I got the shivers. That suite of rooms is almost exactly what I would want for myself. When I was walking out on the grounds and came across the garden pavilion with that endless view, I cried at the beauty and perfection of that small brick building. I don't think anyone saw me, but who cares if they did? Since Jefferson put his heart and soul into drawing the plans and building it, I truly believe that visiting Monticello is like looking inside a great man's mind. Abraham Lincoln's home in Springfield, Illinois. 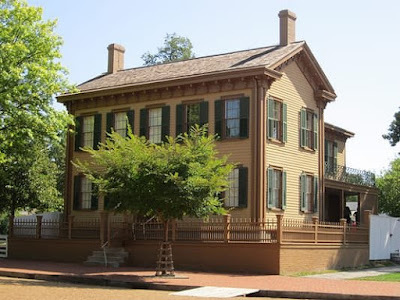 Lincoln's home in Springfield, Illinois is the second home of a famous American in which I've felt the presence of greatness. I grew up about forty-five miles southeast of Springfield, so I've visited this house several times. I may not have felt I was looking inside Lincoln's mind as I was wandering through the rooms of his house, but I've been covered in goosebumps each and every time. When I was ten, my grandparents, my mother and I loaded up the Chevy and traveled cross-country to visit a relative in Grass Valley, California. 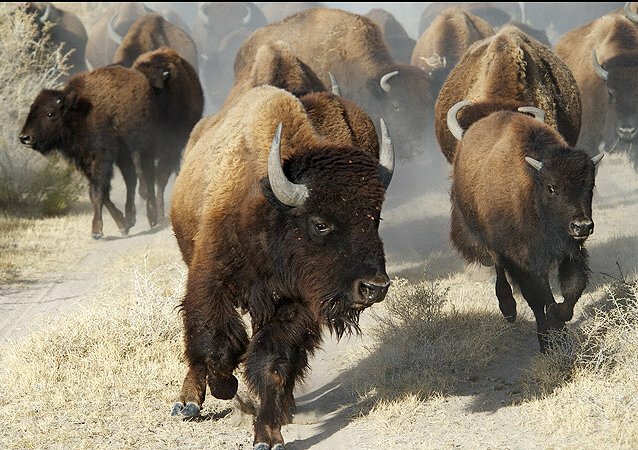 Outside Cody, Wyoming, I was sitting in the backseat looking out the window when I saw a herd of buffalo come up over a rise at a dead run. My first look at buffalo and I was riveted. That hill, the green grass, that herd of huge beasts, the dust... it's still one of the most beautiful sights I've ever seen. 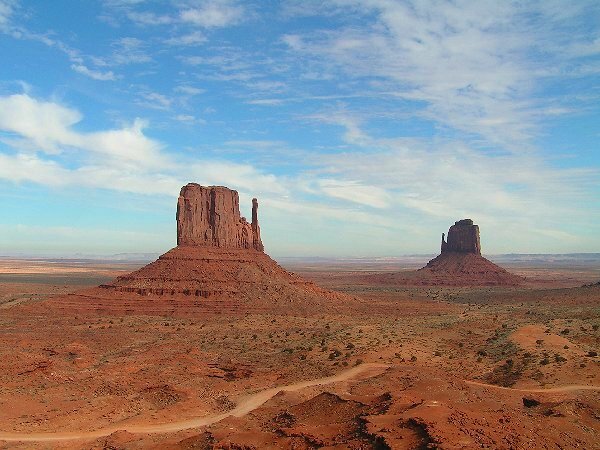 The Mittens, Monument Valley, Arizona. The second time I visited Monument Valley, Denis and I drove the dirt road that hits a few of the highlights, and I wouldn't let him wash the orange mud off the car when we came home. The third time we stayed at Goulding's Lodge in a room with a private balcony where we could sit and watch those incredible rock formations change color in the sun. That night as we walked to the restaurant for dinner, the closest one was a blazing hot pink in the setting sun. The next day we took an all-day tour of Monument Valley and Mystery Canyon. It was just the Navajo guide and Denis and me because it was the end of January and rather... cold. But I didn't care. The Navajo call Monument Valley the "land of room enough and time enough," and I wouldn't mind living up there for a few months. Mystery Canyon is filled with ancient dwelling places high up in the rocks. One such place was decorated by tiny paint-covered handprints on either side of the door so it's called Baby House. I was so overwhelmed by the sky, the space, the beauty all around me that I didn't talk much the entire time. And I don't think anyone saw me cry this time either. Lime Kiln Point Lighthouse, Washington. I took a long ferry ride to San Juan Island, drove to the opposite side of the island, and walked to Lime Kiln Point Lighthouse. The area is a state park, and I found an empty picnic table, sat down, and waited. My patience was rewarded, and I got to watch a pod of orcas swimming and feeding in the Haro Strait. As far as I know, this is still the only whale watching state park in the country. I'm going to have to go back so I can get better photos than this one that I had to scan. 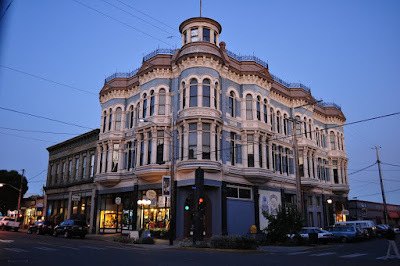 Hastings Building, Port Townsend, Washington. If I lived in Washington, I think I'd choose Port Townsend. 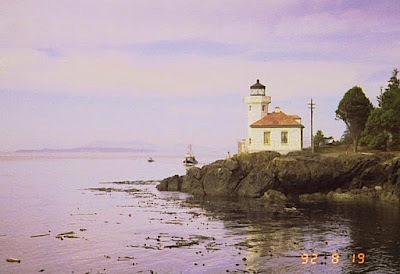 It's a wonderful Victorian era seaport on the Olympic Peninsula with fantastic views of the Strait of Juan de Fuca. It's also filled to bursting with wonderful old architecture-- like the Hastings Building above. 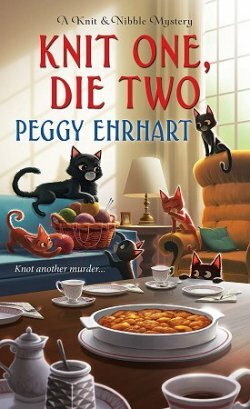 The shopping is excellent-- I hope the bookshop is still there-- and I had fun driving around just looking at the buildings, watching deer graze on the lawn in front of the courthouse, and going to a restaurant just off the waterfront to eat seafood. I was enjoying myself so much that I almost missed the ferry. 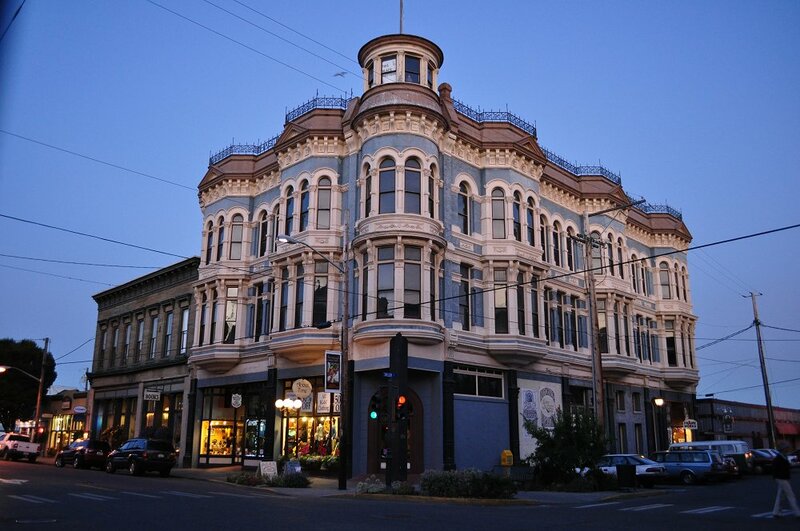 Like Lincoln's home and Monument Valley, Port Townsend is a place I've visited more than once. Aerial view of Cahokia, Illinois. The most sophisticated prehistoric native civilization north of Mexico can be found a few miles west of Collinsville, Illinois, close to the banks of the Mississippi River. 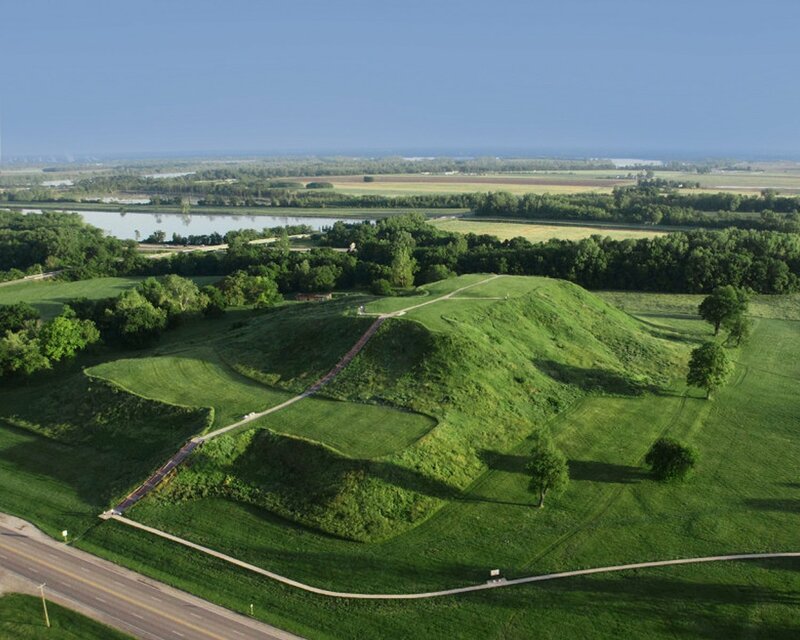 At one time, Cahokia was one of the greatest cities in the world-- in 1250 AD it was larger than London. It was so quiet when Denis and I visited. The traffic on the highway that cuts through this ancient city wasn't enough to disturb the tranquillity. Even though the mounds-- the remnants of monumental public buildings-- are covered with grass, they are still awe-inspiring. And if you visit at the right time of day-- as we did-- you'll see dozens of snowy white egrets. 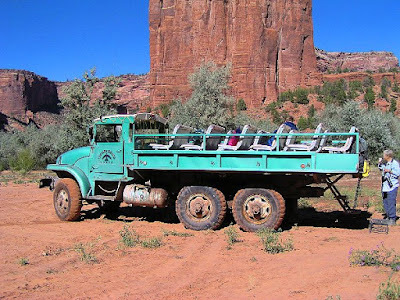 I thought you might like to see how we traveled on our all-day tour of Canyon de Chelly (pronounced "Shay"). 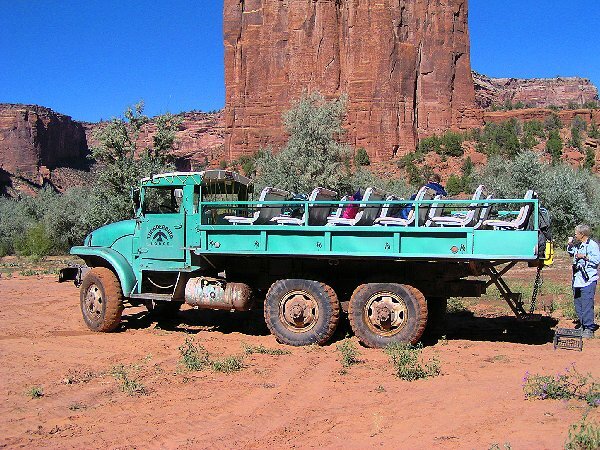 The Korean War-era troop carrier was much more comfortable than it looks and handled areas with quicksand very well. There is a road up above that you can drive around the edges of Canyon de Chelly, but if you want to go inside the canyon (actually three canyons that converge), you must have a Navajo guide. Towering cliffs marked with bands of white, rust, black, and blue. Ancient ruins seemingly everywhere you look. And hogans because Canyon de Chelly is still lived in and farmed. We saw so much that day. 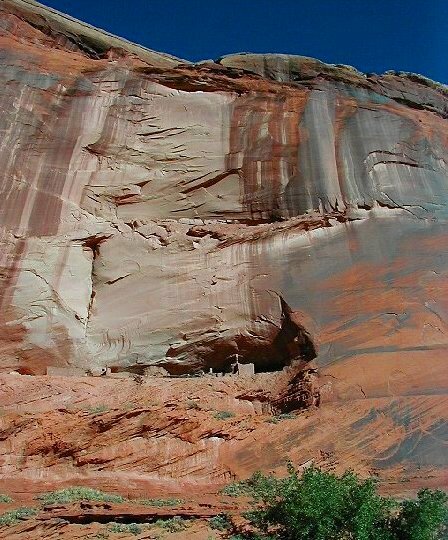 Antelope House, White House, Mummy Cave, Spider Rock.... Canyon de Chelly feels like a protective mother who has been providing shelter and food for millennia. And-- dare I say it-- I much prefer it to the Grand Canyon. There's something deep inside me that prefers the natural world-- especially areas of wonder that put us scrawny humans in our place. 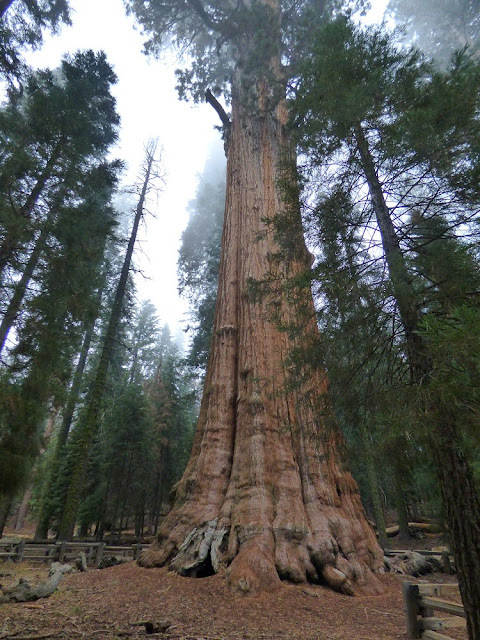 Sequoia National Park was a place I remembered with awe from that cross-country trip when I was ten. At about this time last year, Denis and I drove the twisting road up the mountain and into the park through drifting wisps of cloud, and when I began seeing big trees with cinnamon-colored bark, I smiled. There's something about looking up and up and up at a magnificent tree like the General Sherman above and not being able to see the top. When I'm in the redwoods, I feel as though I am in a holy place. Whitewater Draw, Cochise County, Arizona. In winter, shallow lakes form in the Sulphur Spring Valley in places like Whitewater Draw. Thousands upon thousands of migrating birds-- like sandhill cranes-- winter here; it's one of the premier birding spots in the world (just ask crime fiction writer Ann Cleeves who's been known to visit). 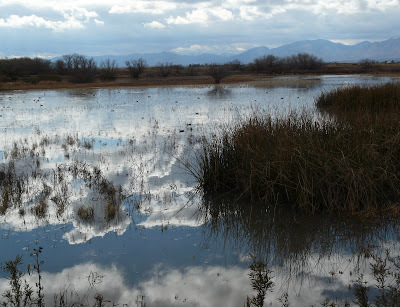 Denis and I love spending time down here because of the abundant wildlife, the history, and the wide open spaces. And... once you've heard the shiver-inducing cries of thousands of sandhill cranes, it's a sound you'll never ever forget. Well, that's today's list of my ten favorite visited places in the U.S. Did I mention any of your favorites, or are some of these places on your travel wish list? Which ones? You know inquiring minds would love to know! 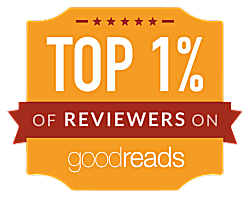 What top ten list is next? Who knows...but one did just occur to me-- the top ten places on my own travel wish list! I know what you mean. Every time I see a list like this, I start compiling my own!